Hockey's holy grail is touring Ottawa in a four-day celebration of the storied trophy. 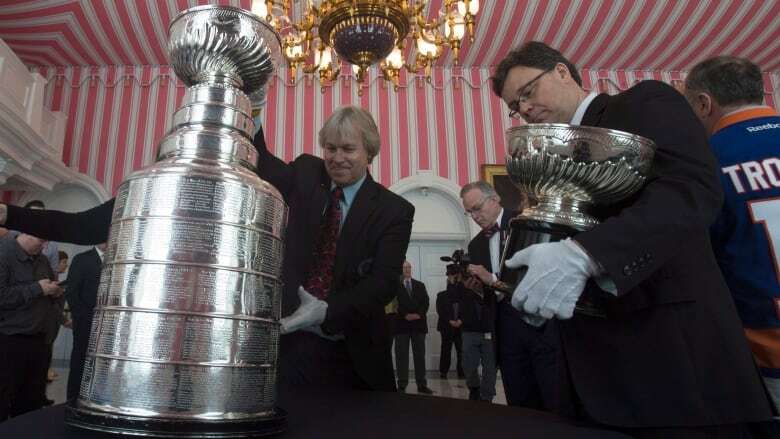 Hockey fans rejoice: the Stanley Cup was returned to Rideau Hall on Thursday as part of a special homecoming. 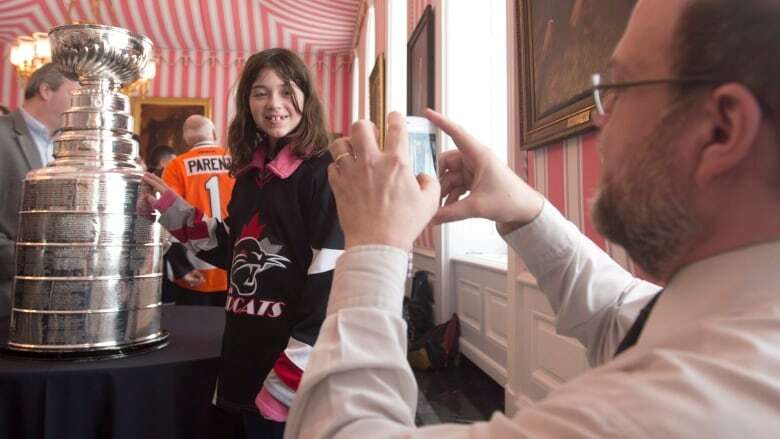 The Governor General's residence was but the latest stop in the storied trophy's four-day tour of the nation's capital, in celebration of the Cup's 125th anniversary. "What began as a humble trophy to honour the winner of the Dominion Challenge has evolved into a global symbol of excellence in sport," said Governor General David Johnston in a news release. 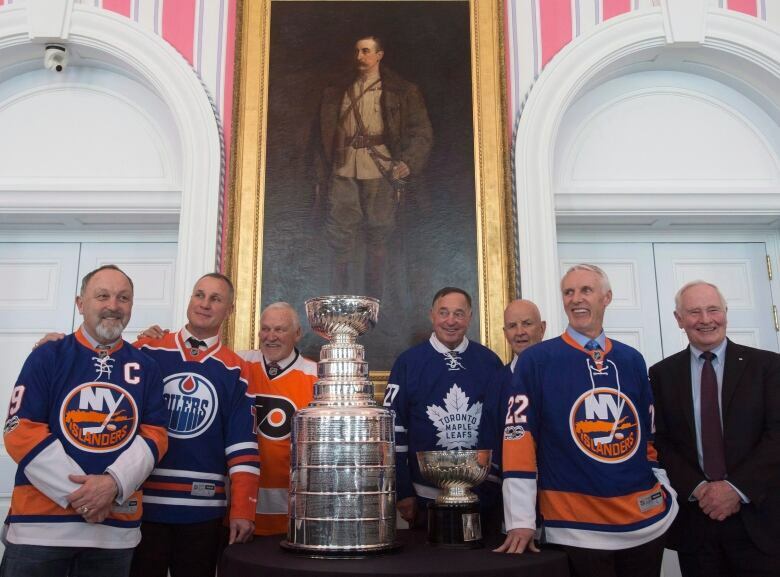 Governor General David Johnston, right, poses with the Stanley Cup and former NHL players. From left to right, Bryan Trottier, Paul Coffey, Bernie Parent, Frank Mahovlich, Dave Keon and Mike Bossy. (Adrian Wyld/Canadian Press)Several hockey legends were at Rideau Hall to welcome home the trophy, including Mike Bossy, Paul Coffey, Dave Keon, Frank Mahovlich, Bernie Parent and Bryan Trottier. 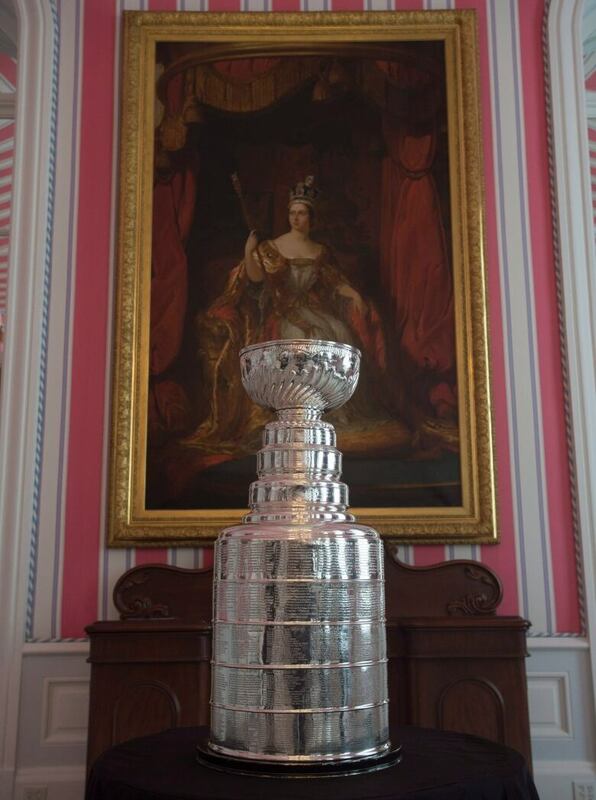 The Cup was prominently displayed in the Tent Room beneath a portrait of Lord Stanley, who served as Canada's Governor General from 1888 to 1893. Eager fans were also invited to see hockey's holy grail up close. NHL commissioner Gary Bettman will also visit Ottawa on Friday, when he will be the guest speaker at a sold-out Mayor's Breakfast. Sources have also confirmed that the Ottawa Senators and Montreal Canadiens will announce an outdoor NHL game to be held in Ottawa at a news conference on Friday morning. Originally known as the Dominion Hockey Challenge Cup, the Stanley Cup was commissioned in 1892 by then-Governor General Lord Stanley of Preston. It is recognized as the oldest trophy awarded to professional athletes in North America. The original, amateur Ottawa Senators hoisted the Cup six times between 1910 and 1927.